You’re gonna love the new ION wallet. ION presents a preview of a snappy new wallet that is, elegant and feature-packed, replacing the clunky Qt wallet for a more intuitive user experience. Did we mention it’s gorgeous? Check out the screenshots below for a first look at the new wallet. Coming to a computer near you Fall 2018! Easy access wallet settings make customization a snap. 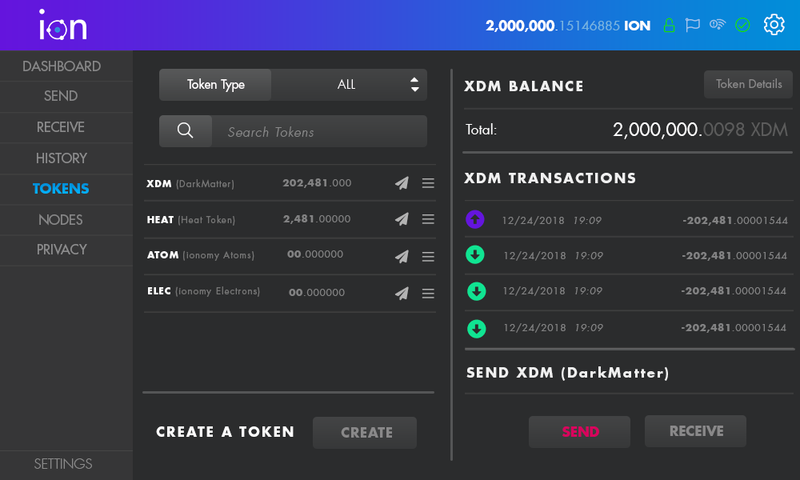 Manage tokens like Dark Matter (XDM), Offroad Heat (HEAT), ATOMs, and Electrons (ELEC). Create new tokens on the ION blockchain and manage directly from the wallet. Follow ION news on Blockfolio Signal! Blockfolio is the most popular crypto portfolio management app, now with Signal notifications. Tell your friends to download the app and add ION to keep up with all the exciting ION and ionomy news coming! Multi-Asset Exchange: ionomy Platform 3.0 is coming!